It was butter that made the city of Dresden the home of Germany’s most famous edible Christmas tradition. In 1491 Pope Innocent VIII gave in to the request of the Saxonian rulers to lift the ban on dairy products during the days of fasting. After he sent the legendary Butterbrief (“Butter Letter”) the bakers in Dresden started to use butter in their Stollen, and the sweet bread that we know today was born. Categories: Uncategorized | Tags: bread baking, christmas, cookbooks, cooking, food, german bread, german cookbook, german food, German history, germany, recipes | Permalink. We had several inches of snow at Thanksgiving. 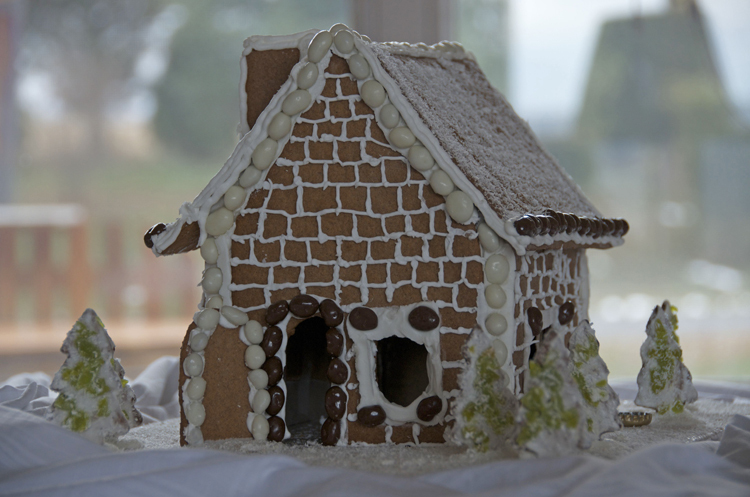 Our house with its lit windows created a winter wonderland look – like the gingerbread house in Hänsel and Gretel. It put me in the mood to make a gingerbread house. Categories: Uncategorized | Tags: christmas, Christmas decorations, cookbooks, fairytales, folk tales, food, german cookbook, german food, German gingerbread, German history, germany, gingerbread, gingerbread house, grimm brothers, hansel and gretel, recipes | Permalink.